Car Rental at El Paso Airport (ELP) - No Hidden Charges ! Van rentals, convertibles, luxury cars, SUVs and sports cars are some of the most popular & highly rented categories at the El Paso International Airport. Rent a car for El Paso International Airport in just three quick steps - search, compare, reserve! Cancel your El Paso International Airport car rental for free, up to 48 hours before the pickup time. Associate with us for hiring an El-Paso International Airport car rental at lowest possible price. Our fleet of cars comprise of best variety from big suppliers covering brands that deal with economical to luxury cars. Scan El-Paso International Airport car rental deals through our searchable booking engine. Various current deals are available with supplier’s name, price which is displayed in your own currency, car model and the facilities. This information makes it quick and obvious for you to choose the deal. Pre-plan if you are disembarking at El-Paso International Airport by pre-booking a car rental. This assures that on arrival you will not have to wait for the cabs, public transport or seek car rental hire venues. Moreover last minute hiring rates at the airport tend to be higher as opposed to the rates you will get on an advanced online booking. Hence pre-book a car rental for El-Paso International Airport for a budgeted ride. El Paso International is the public airport of El Paso. It is situated four miles northeast of El Paso city. It is a busy airport as nine major airlines ply through here and billions of people use it everyday. The airport is connected with all the major cities of USA. Passengers using this airport can hire a car from a reliable car rental service to reach their destination comfortably. El Paso city is the jewel of the El Paso County. It is located on the Rio Grande. It is a wonderful city with many tourist attractions which includes many indoor and outdoor activities. You can enjoy the various places of interest or go out for shopping by hiring a car. Among the various offers of the city, you have the option to visit the Centennial Museum to see the collection of Casas Grandes ceramics. You can drive your way to the Chihuahuan Desert Gardens. And if you drive down to McKelligon Canyon Park you could enjoy the breathtaking scenic landscape. Watching plays in the Plaza Theatre can be a good diversion. The El Paso Zoo with its famous Amur leopard and the Aruba rattlesnake, should be a “must visit’ on your itinerary. Displays artifacts from various artists. It is a military airport in El Paso County. Features collection of civilian & military aircrafts. 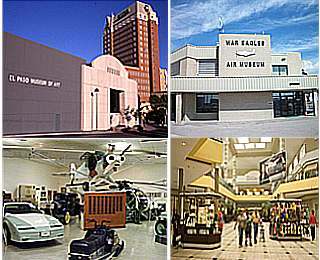 Unique museum exhibiting the history of USA. A gigantic shopping mall in El Paso.